The act of papyrological interpretation is a continuous thought process that unravels non-linearly (Youtie, 1963; Terras, 2006). Throughout this sense-making process, ancient and scarcely legible documents progress from the status of pure physical objects to that of meaningful historical artefacts. Within the e-Science and Ancient Documents project,1 we aim to make explicit some of the implicit mechanisms that contribute to the development of hypotheses of interpretation by designing and implementing a web-based software offering digital support for the hermeneutic task. This tool aims to record the intermediary hypotheses of interpretation, thus keeping track of the rationale and allowing easier and better revision when required. The model we have adopted (Roued Olsen et al., 2009) is that of a network of percepts, where a percept is defined as a minor interpretation that stems from perception and cognition (Tarte, 2010). An understanding of expert knowledge and of how it is mobilised is required to identify the crucial steps that allow us to reconstruct a rationale. The level of the granularity at which we choose to provide support also is essential to the usability of the software. Further, each percept, each intermediary interpretation, each piece of evidence used either to support or to invalidate a claim is potentially mutable. The implementation of an Interpretation Support System (ISS) taking these considerations into account poses the question of how to digitize or record a thought process; it is an epitome of the ‘continuous-to-discrete’ (or ‘analogue-to-digital’) problem. In the theoretical and life sciences, measurement devices are developed to sample the signals of interest. Then, based on the discrete sampled signal, on an underlying model of the behaviour of the signal, and on more general knowledge of signal processing and information theory (e.g. the Nyquist-Shannon sampling theorem), the continuous signal can be reconstructed with minimal deviation from the original signal. Similarly, the ambition of our ISS is, based on an appropriate model of the papyrological hermeneutic task, to allow the user to capture the information necessary to the reconstruction of the rationale that yielded a given interpretation. Two difficulties in sampling the interpretive thought process are: (1) to take advantage and to beware of the sense of scientific rigour that digitization conveys; and (2) to allow the digital expression of uncertainty and mutability of percepts. In this paper, we explain how, while attempting to digitize the papyrological interpretation act, we strive to avoid spurious exactitude and accommodate genuine uncertainty. The papyrological model of reading developed by Terras (Terras, 2006) identified ten levels of reading, corresponding to ten levels of granularity at which an interpretation in progress is discussed. Tools stemming from web-based technology (Bowman et al., 2010), image processing (Tarte et al., 2009) and artificial intelligence can help support the digitization of the hermeneutic task (see fig. 1). To illustrate how we negotiate between spurious exactitude and genuine uncertainty, we focus here on two specific stages of the digitization of the papyrological interpretation process: how artefact digitization is being performed; and how, by identifying the mechanisms that trigger the jumps between the ten levels of reading, we propose to address the representation of uncertainty. Figure 1: Model of the act of interpretation detailing the various levels of reading based on (Terras, 2006) and the tools involved in the implementation of our ISS. 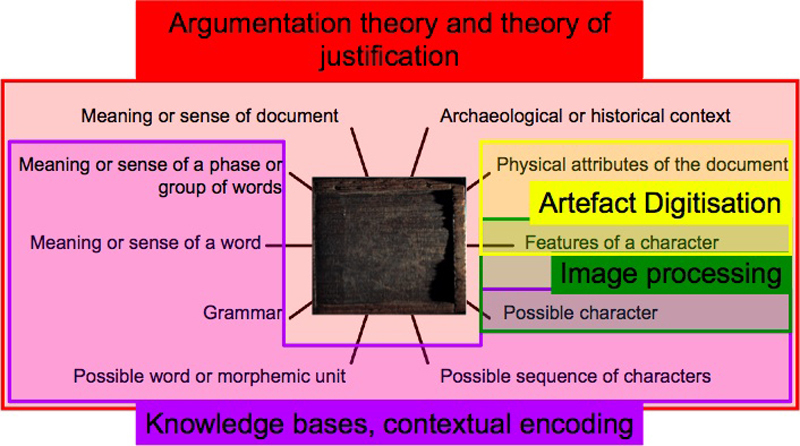 Note the deliberate choice of representation of the ten levels of reading as star-shaped around a stylus tablet to convey the recursive nature of the hermeneutic process. Although the levels of reading are defined according to the granularity of the subject discussed, oscillations between levels of reading constantly occur, and these oscillations do not necessarily take place between adjacent levels of reading. The problem of spurious exactitude is most prevalent at the stage where the text-bearing artefact is digitized. For stylus tablets, for example, high-resolution pictures are not enough. The materiality of the artefact needs to be taken into account in a similar way as the experts exploit it in the real-world. The guiding principle we choose to follow in this context is mimesis. Indeed, when the papyrologists have physical access to such an incised tablet, in order to see better the incised text, they lay the tablet flat on their hand, lift it at eye level and expose it to raking light while applying pitch-and-yaw motions to it. This signal enhancement strategy exploits the shadow-stereo principle by which stronger and more mobile shadows and highlights occur at the incisions than they do on the bare wood; the text is thereby accentuated. Digitally imitating this process, we capture series of images of incised tablets with varying light positions (Brady et al., 2005), allowing users to reproduce digitally the visual phenomenon they naturally exploit in the real-world. Note that, similarly to signal measurement devices, we adopt a digitization process that is already part of the interpretation process. And the intention behind artefact digitization, as well as the intention behind signal measurement, is always an implicitly set variable that affects downstream results. When attempting to capture the milestones of the thought process that builds an interpretation of an ancient or damaged text, we need to capture the uncertainty of the intermediary percepts and their mutability. A numerical approach to uncertainty such as bayesian networks could have been adopted, but such a quantification of uncertainty usually presupposes that problems are complete, i.e. that all the alternatives to a given situation are known (Parsons & Hunter, 1998). Instead, we have decided to turn to argumentation theory (Parsons & Hunter, 1998) and theory of justification (Haack, 1993), and combine them to provide a formal, yet invisible, epistemological framework that will allow us to point out inconsistencies without forbidding them. Indeed, inconsistencies in an unravelling interpretation naturally occur and can be rooted either in the implicit expectations of the user or in the validity of the actual claims (see Tarte, 2010 for an account of an inconsistency due to an implicit assumption and its resolution). The balance to be found here (Shipman III & Marshall, 1999) is between on the one hand the usefulness of a formal system as a backbone to support reasoning under uncertainty and make implicit mechanisms explicit, and on the other the excess of formalism and explicit formulation that can become a hindrance by creating for the user an overhead disruptive to the interpretation process. Here again, our design choice is based on the observation of the experts at work. We allow both palaeographical and philological approaches in combination, through the possibility of tracing the letters and of handling the text as a crossword puzzle (Roued-Cunliffe, 2010); these are both approaches that we have identified as the main strategies experts develop when interpreting documents (Tarte, 2010). The expression of uncertainty is then made inherent to the mode of interaction with the artefact, and the transposition of the real-world tasks of drawing and crossword puzzle solving allows us to keep the interface intuitive while, in the background, more formal mechanisms can run routines such as consistency checks and consultation and constitution of knowledge bases. In her doctoral work, Roued-Cunliffe (Roued-Cunliffe, 2010) is currently concentrating on the crossword puzzle approach and combining it to consultation of knowledge bases through web-services. Digital technologies can easily trick the mind into thinking that their use confers an exactitude on the results obtained with their support. It is however worth noting that in the sciences too, digitization is always made with an intention. When looking to sample a continuous signal, be it a temperature as a function of time, or a thought process as a function of time, the sampling strategy is always adopted in the light of an intention. Digitization is actually also an act of interpretation. To record digitally the continuous papyrological interpretation process, we have to identify clearly our final aim, and to adapt our sampling strategy accordingly. Here, our aim is to enable to record, reconstruct, back-track if necessary, the interpretation process by making explicit (some of) the epistemological evidence substantiating the interpretation in progress; an added benefit to the software is that it will also enable easier production of an edition of a text, as the evidence will have been laid out clearly. Capturing uncertainty is vital to the recording process, and being conscious that its very capture is also part of the hermeneutic task is crucial to allow the software design to take on board the elements that are core to the whole interpretation process. This work was supported by the joint AHRC-EPSRC-JISC Arts and Humanities e-Science Initiative UK [grant AH/E00654X/1]. The author wishes to thank Prof. Alan Bowman, Prof. Sir Michael Brady, Dr. Roger Tomlin, Dr. Melissa Terras, Dr. Charles Crowther and Henriette Roued-Cunliffe for their support, as well as the reviewers for their helpful comments.